Boonton, NJ – Bio-Chem Fluidics will display its Electric Rotary Valves for sample collection, loop injection and flow path selection at the American Association for Clinical Chemistry 2013 Expo, booth 2604. The show takes place from July 30 to August 1 at the George R. Brown Convention Center (Houston, Texas). Bio-Chem Fluidics Electric Rotary Valves are engineered to integrate easily into OEM systems. The valves use ¼” - 28 UNF fluid port connections and flow configurations designed to match the industry standard most commonly found in existing systems. 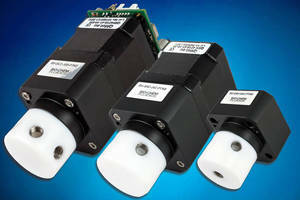 Electric Rotary Valves provide a lower pressure drop than conventional solenoid mixing valves, and use a unique PTFE fluid path for maximum compatibility with aggressive solvents. For more information, e-mail sales.us@biochemfluidics.com, visit www.biochemfluidics.com or call (973) 263-3001. Bio-Chem Fluidics manufactures inert, high reliability, solenoid-operated isolation valves, pinch valves, dispensing pumps and manifolds for a wide range of industries including analytical chemistry, clinical diagnostics and medical device. Bio-Chem Fluidics’ staff of design and prototyping experts can offer simple modifications of standard products as well as completely customized designs.